The Zine Picnic in Yoyogi Koen has been moved to Monday because of this Tokyo rain! 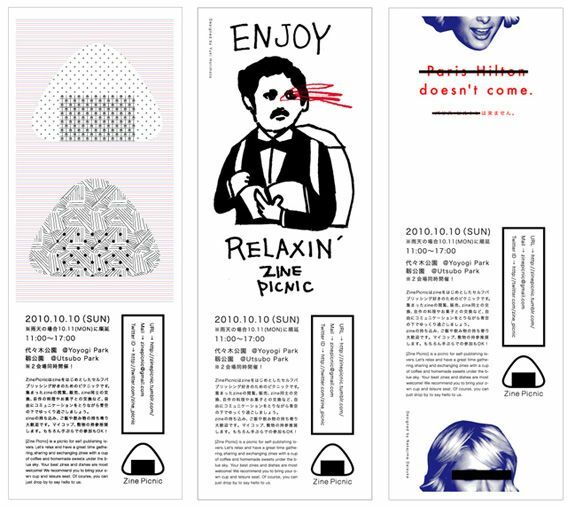 [Zine Picnic] is a picnic for self-publishing lovers. Let’s relax and have a great time gathering, sharing and exchanging zines with a cup of coffee and homemade sweets under the blue sky.Your best zines and dishes are most welcome!We recommend you to bring your own cup and leisure seat.Of course, you can just drop by to say hello to us. 11:00 - 17:00 Monday 11th October. I hope you can come along! For updates please follow Zine Picnic on twitter. See some pics from the last Zine Picnic here.